San Bernardino County Veterans Treatment Court Fact Sheet | Reaching New Heights Foundation Inc.
San Bernardino County recognizes the profound honor and commitment of those who served in the United States Armed Forces. It is our mission to provide an interagency, collaborative treatment strategy for those veteran’s in the criminal justice system using evidence based practices. Our Veterans Court will increase public safety while improving the lives of veterans and their family by healing the physical and invisible wounds of those who have entered the criminal justice system as a result of their dedicated service. Veterans’ courts are hybrid drug and mental health courts that use the drug court model to serve veterans struggling with addiction, serious mental illness and/or co-occurring disorders. They promote sobriety, recovery and stability through a coordinated response that involves cooperation and collaboration with the traditional partners found in drug and mental health courts in addition to the U.S. Department of Veterans Affairs health care networks, the Veterans’ Benefits Administration, and, in some programs, volunteer veteran mentors and veterans’ family support organizations. San Bernardino County VTC collaborative team supported VA Veterans Justice Outreach (VJO), Riverside County Mental Health (assessment), District Attorney (the peoples support)Public Defender (legal support), Probation (discipline and accountability) Mentor (Encourage, Guide, Friendship), Judge (Leadership) and Riverside County Department of Veteran Affairs (important resource). By University of La Verne College of Law on Oct 28, 2012 Whether he is speaking to highly educated lawyers, fellow judges, or people who have lost everything from drug addiction, San Bernardino County Superior Court Commissioner Ronald J. Gilbert treats everyone the same way – with respect. 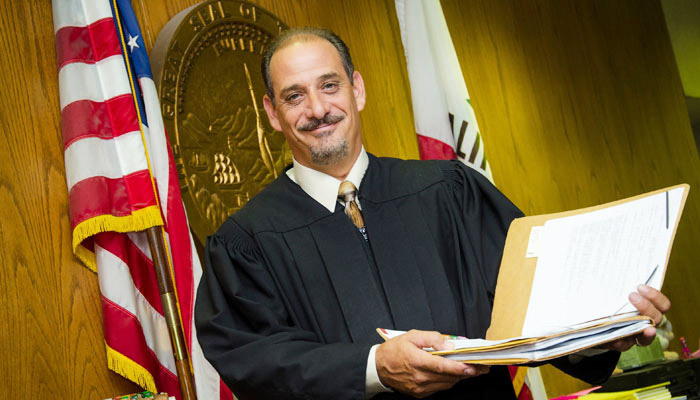 A University of La Verne College of Law ’84 alumnus, Commissioner Gilbert practiced law as a public defender in Rancho Cucamonga for eight years before being sworn in as a judge in 1993. In addition to running the drug courts, he presides over traffic and other cases, including unlawful detainers and short-cause civil actions. Commissioner Gilbert, whose first passion was acting, recognizes that people who come into his courtroom are not happy to be there. Each day, Commissioner Gilbert juggles a full calendar. Fridays, which are devoted to drug court, are particularly hectic. He hears adult cases in the mornings and juvenile cases in the afternoons. The goal of Commissioner Gilbert’s drug court is to divert offenders out of the criminal justice system and into a recovery program where they can stay clean and sober. The program requires that participants stay clean of drugs and alcohol for 18 months, show up for court dates, undergo random drug testing, attend group therapy and participate in 12-step programs. Using humor and being pleasant mitigates the tension, he said. “I accomplish the same goals so what’s the point of being a jerk?” he said. “I’m friendly. I’m playful. I come across more like an older brother than a father figure.” When they succeed, Commissioner Gilbert is there to commend them. He attends graduation ceremonies for those who complete drug court and has been known to hand out cakes at Narcotics Recovery meetings when addicts reach certain milestones in their sobriety. At biannual barbeques for drug court clients who are going through recovery programs, Commissioner Gilbert cooks up hot dogs and hamburgers. He calls being part of that transformation is rewarding. “I actually do get a chance to change peoples’ lives and help them get back on a better path,” he said. On Thursday, March 25, 2010 the Western San Bernardino County Bar Association will honor Commissioner Ronald J. Gilbert with their “Judge of the Year Award” at Sierra Lakes Country Club. Our board joins the WSBCBA in honoring Commissioner Gilbert for his 25 years of advocacy, his commitment to the administration of justice and his distinguished career as a jurist. I know many of the lawyers and judges from the West End will be in attendance and I encourage you to join them in congratulating Commissioner Gilbert.